M.C. Nugget and I left this morning on a road trip up to San Francisco. Much as I love travel, this morning, as I started to collect all of the things I need with me at all times (my iPhone charger, electric exfoliator Botox-cream and my hair protectant, because I must always have tight skin and non-fried hair while driving along PCH),, and as I started to ask myself out loud, “what was it I wanted to bring?” I thought this is why people hire people for this. Because, you guys, I just got back from San Diego on Monday and I woke up this morning in a cloud and in obvious need of more sleep. 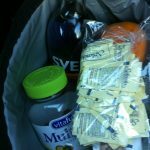 So we were loading up the car (Nuggie was) and I was making my last second rounds for important bring-alongs (Splenda packets, Vodka, gummy vitamins: CHECK). I grabbed my purse but noticed a pile of papers stuffed inside my cute little satchel. The only thing I thought was “get RID of the excess,” as I laid the pile of papers on the hutch and ran out the door. People, this post could be about how important communication is, but the truth is I am the dizzy blonde (pun intended, and if you read my posts, you’ll get the pun) in this. Nuggie had informed me he put the directions in my purse this morning, but I was too distracted by the big screen to notice. Thank god for iPhones and google maps. We are on our way and doing great. We are just outside of the Hoover Dam now. 12 Responses to "For those times when you forget these"
Thanks H! We are having a blast. We always do. Mmmpphhhuuuhhhh!!! and I am the queen of easily distracted. LOL Thanks James. MsCheevious recently posted…You’d like oxygen with that? Botox makes a cream? You really must share this right now! LOL. Funny you picked up on THAT Elyse! HA! I left the bottle at home, believe it or note. It was totally empty. I will pull it out of the trash and tell you what it is. And no… Botox doesn’t make it, but the creators of the product say it has the same effect as Botox. And I did like using it. My wife and I have – over the last almost 40 yrs – come to realize that communication is no longer important. We both know, she talks, I don’t listen. We have come to use a little know skill inside each human – osmosis knowledge. She knows that when we travel to Detroit from our little NW Ohio abode, as we approach Toledo, I will ask – Where is the cheapest gas? She now has GasBuddyApp on her phone and has learned to use it. I have it on MY phone but I don’t phone and drive well – it takes all two of my brain cells to keep the car on the road. I’ve learned when we travel, locate a souvenir shop. Ignoring her will only reap havoc. In the grocery store, she will say “Ok, I forgot, I need…” and before she finishes, I will state “They’re in aisle 10, I’ll get 3 cans.” This uncanny ability to finish each others sentences and know what the other will want ahead of time is a known fact. Ask any of our 4 boys, 4 daughter-in-laws or 8 grandchildren. It scares the crap out of them. Although, #1 son and his wife are finally getting the hang of using the latent skill of osmosis knowledge. The last time we migrated from North Carolina to Florida I left as avocado ripening in the window. We always leave something. Thankfully my son lives there and rescues what I leave. Now, tell us more about the Botox cream. Ahhh yes… but you see if you leave the printed directions and hotel confirmation sheets, the only thing your son could do is read them to you. LOL So in this case, even if I had a rescuer… well I was out of luck! We had to re-print things at our friend’s house. Thank goodness for friends and technology! I’m stuck on electric exfoliator Botox-cream. Does it work? !